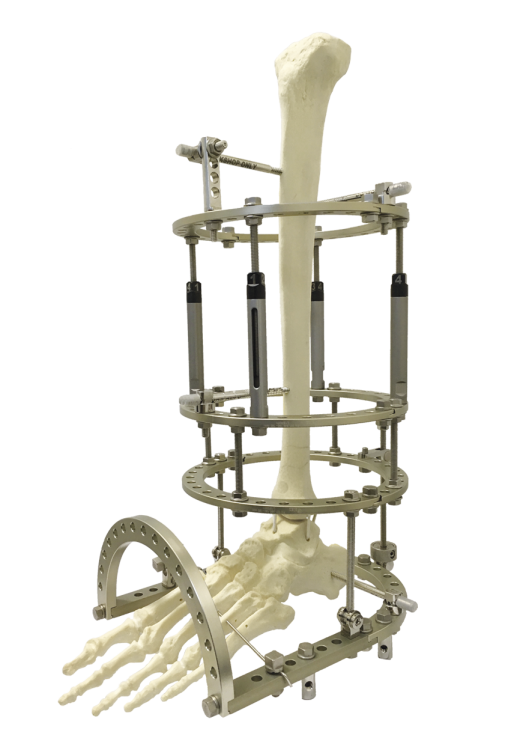 The Circular Fixator SELAZ is a system for fracture treatment, deformity correction and bone reconstruction in general. They are available in two versions: Aluminium and Radiolucent (Carbon fiber). Composed by rings, semi rings, femoral arch, conecction plates, curve and twisted plates, extention plates and accessories for assembling the foot plate, the Aluminium Circular Fixator is made of aluminium alloys used in the aerospacial field, making the system lighter and increasing its mechanical resistence. Beyond the tradicional components, the Circular External Fixators SELAZ have distractors and special joints, and also a huge range of accessories that enable many different kinds of treatment. The elements of connection in inoxidable steel are differenciated by its finish, quality of the material and project, priorizing the distribution of efforts and to reduce loosening of the components in the assembly.